Prior to World War I, many authorities believed that countries with substantial agrarian sectors and grain exports, including the Russian Empire, could overcome war hardships more easily than those countries that imported grain. This column asks why the experts got it wrong in the case of Russia, and concludes that the economics and politics of the Russian grain and labour markets provide the answer. It was impossible simultaneously to mobilise 15 million males into the Russian army, procure the grain to feed them as soldiers, and avoid revolution. On 29 October 1917 (16 October in the old Russian calendar), Sergei Prokopovich, the Russian minister of food procurement, had to acknowledge in public that there was little or no grain in government storage to feed the army and residents of the capital. On the Eastern front, St Petersburg and the Russian army in the south had grain reserves for a week, but armies in the north had grain for little more than one day and some of their regiments were beginning to starve. Prokopovich worried that open clashes over grain distribution between producers and consumers could destroy the Russian army and state (Prokopovich 1918). As it turned out, his fears were realised. Ten days later, the Bolsheviks overthrew the Provisional Government and seized power in Russia, holding it for more than 70 years. Russian difficulties with grain procurement were not well anticipated. Before the war, many authorities believed in fact that those countries with substantial agrarian sectors and grain exports, including the Russian Empire, would switch to food autarky and overcome war hardships more easily than those countries that imported grain (Broadberry and Harrison 2005). Why did the experts get Russia wrong? Why, instead of victory, did Russia’s Great War end in defeat and revolution? The economics and politics of the Russian grain and labour markets provide the answer. In short, it was impossible simultaneously to mobilise 15 million males into the Russian army, procure the grain to feed them as soldiers, and avoid revolution. An optimistic view of Russian war prospects relied on the assumed presence of excess labour supplies in the Russian countryside. Analysing the economics of the Russian village in 1901, a government commission estimated surplus labour at 51% of the rural labour force, and many independent studies reached similar conclusions; Lev Litoshenko (1926), for example, calculated the labour surplus at about 40%. The optimists believed that on the outbreak of the war the excess labour could be easily mobilised into the army without any serious loss of agricultural output. The underlying assumptions were poorly founded, however. The estimates paid little attention to the economic activities of rural citizens other than the cultivation of cereals and the results were misleading. 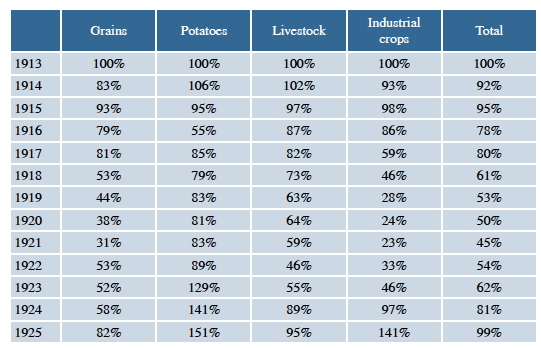 Note: In 1913 grains accounted for 50% of agricultural production by value, potatoes for 13%, livestock for 28%, and industrial crops for 8%. Source: Markevich and Harrison (2011: data appendix, Table A11). On average, the removal of 1% of the labour force from the Russian countryside was associated with a local decline in the area under grain crops by around 3%; the removal of a marginal worker from a district would result in a yearly loss of 296 rubles, roughly four times the subsistence level (Castañeda Dower and Markevich 2018a). These results speak against the existence of surplus labour in the Russian village. Given the Russian Empire was predominantly rural, it also suggests that there was little, if any, slack in the economy in peacetime, so that the war effort could not be expanded without redistributing inputs away from civilian uses. A one-fifth reduction in the output of cereals, by itself, would probably not explain the collapse of the Russian grain market and a national food crisis. However, the war also altered the composition of grain crops and damaged the incentives of individual farmers to supply agricultural produce to the market. Two types of farms co-existed in Russian agriculture before 1917: traditional peasant farms governed by communal land tenure, side by side with farms having private tenure. Peasant households had non-market access to small parcels of land within the commune on which to farm. Private landowners either farmed their land by hiring labour from peasant households, or they rented their land out to industrial peasants. Statistics that are available by farm type show clearly that, in an average district of the Russian empire, the negative effect of mobilisation was stronger on private farms, which reduced their cultivation of grain by more than farmers using communal lands. On average, however, privately held land was more productive than land held communally and produced the bulk of marketed grain in peacetime. The differential response of private and communal farmers in the countryside therefore moved labour uphill from more to less efficient uses. Why did peasants reallocate labour towards lower efficiency? Wartime raised their uncertainty and, with it, the attraction of the minimum income guarantee provided by access to communal land, relative to the risks of the market and of profit-maximising behaviour. In line with this interpretation, the negative differential in the response of private farms to the mobilisation shock was more pronounced in areas where the commune was stronger. Simultaneously, communal farms shifted efforts away from the market crops (wheat and barley) bought by procurement agencies and urban traders towards subsistence crops (winter rye) for on-farm consumption (Castañeda Dower and Markevich 2018a). Another factor working in the same direction, to reduce the willingness of the village to trade with the city, was the wartime mobilisation of industry, which reduced the supply of civilian manufacturing products available for peasants to purchase. The Tsarist government missed this key wartime shift in peasant behaviour away from market operations toward rural autarky. The government believed, correctly, that sufficient grain existed in the country to feed the Russian army and the rear; mistakenly, however, it viewed the task of distributing this grain among consumers as a merely logistical problem. The misdiagnosis led to ineffective treatment. The Tsarist government developed a comprehensive state grain procurement system with local branches all over the Empire, and gradually expanded the regulation of the market for cereals, to little effect. The peasants’ unwillingness to sell grain in wartime led to deepening food crises that directly affected domestic politics. The shortage of food in St Petersburg and persistent bread queues in the city in the winter of 1916/17 triggered the events of February 1917, leading to the overthrow of the monarchy. The Provisional Government of February to October 1917 mostly repeated the mistake. The country kept fighting without any means of bringing the peasants back into the market. To the very end, the government remained optimistic, expecting to resolve the procurement crisis by improving the operation of the railways and redistributing the grain already procured, but without grasping the origins of the problem. Only in September 1917 did the government set about doubling the fixed grain procurement prices; this was too late. In the speech already cited, the minister Prokopovich accepted that higher prices would not encourage peasants to sell grain to the government. Surprisingly, and without any apparent foundation, he continued to believe that massive propaganda would induce the peasants to return to the grain market (Prokopovich 1918). Their promise to solve the crisis of food supply to urban areas was an important factor in support for the Bolsheviks in the autumn of 1917. In his writings of September and October 1917, the Bolshevik leader Vladimir Lenin repeated many times that only a Bolshevik government would get grain from the countryside and distribute bread fairly among urban dwellers (Lenin 1917). District-level variation in the outcomes of the November 1917 elections to the Constituent Assembly suggests that these words carried weight. More urban citizens, especially of the working class, voted for the Bolsheviks in districts where agriculture had suffered more from the wartime mobilisation, where food crises were more likely to persist and develop, and where a redistribution of grain towards the cities would offer higher returns (Castañeda Dower and Markevich 2018b). After the Revolution, the Bolsheviks, now the incumbent party of government, undertook a very different approach to the wartime malfunctioning of the Russian economy and the grain market. To remain in power, they accepted defeat by the Central Powers on the Eastern front, initiating separate peace negotiations with Germany and signing the Treaty of Brest-Litovsk treaty in February 1918. By that time, however, these measures were still not enough to overcome the economic crisis. The political struggle over grain distribution continued, helping to transform the Great War into Russia’s Civil War. Eiditor's note: This column first appeared as a chapter in the VoxEU eBook, "The Economics of the Great War: A Centennial Perspective", available to download here . Broadberry, S and M Harrison (eds) (2005), The Economics of World War I, Cambridge University Press. Castañeda Dower, P and A Markevich (2018), “Labor Misallocation and Mass Mobilization: Russian Agriculture during the Great War,” Review of Economics and Statistics 100(2): 245-59. Castañeda Dower, P and A Markevich (2018b), “Democratic support for the Bolshevik Revolution: an empirical investigation of 1917 Constituent Assembly elections”, SSRN working paper. Golovin N N (2001, first published in 1939), Voennie usiliya Rossii v mirovoi voine, Moscow: Kuchkovo pole. Lenin, V I (1917/1969), Collected Works, vol. 34 (July-October 1917), Politizdat. Litoshenko, L N (1926, published in 2001), Sotsializatsiya zemli v Rossii, Sibirskii khronograph. Markevich, A and Harrison, M (2011), “Great War, Civil War, and Recovery: Russia’s National Income, 1913 to 1928”, Journal of Economic History 71(3): 672-703. Prokopovich, S (1918), Narodnoe khozyaistvo v dni revolutsii, Cooperative Press.